Do you want to curl your hair but cannot find a good hair curler machine? Curled hairstyles look absolutely great if you have the right length of hair but it is the regular salon visits to get your hair curled that can make you miss a great hairstyle. Having a hair curler machine at home makes the whole process so easy as you can get professional hairstyles within minutes without spending a lot of time and money on salon appointments. A curling iron that is designed to give professional results, the Beachwaver curling iron comes with a 1.25-inch barrel and curls your hair in just a few minutes. It has an ergonomic handle and gives you voluminous waves. The body of the machine comes with an LED display which shows the temperature you are curling at. The length of the ceramic tourmaline rod is 6.5 inches and the curler has a heat range of 310 degrees Fahrenheit to 450 degrees Fahrenheit. The price of the curler is high. it heats up in 30 seconds and has a long curling handle to prevent burns. The ceramic tourmaline rod heats evenly and does not damage the hair. The LED display screen helps you keep a control of the temperature. The price of the curling machine is higher than other models. The rotate button on the iron is difficult to operate because of its location. This hair curler machine is a great investment if you want to get beachy voluminous waves. It heats evenly and protects your hair from heat-related damages. If you are looking for an affordable hair curler machine, the Berta curling iron works well and has a brush-like design. 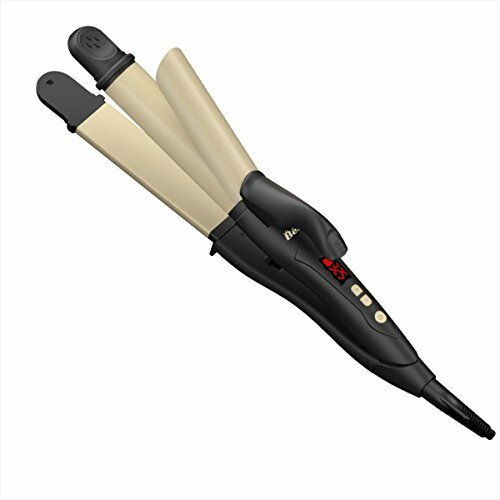 The curler is designed using the dual iconic technology and comes with a ceramic heating rod. The brush design makes it easy to untangle the hair and open the curls without breaking them. The high and low settings and the non-slip rubber grip are some additional features. The price of the curler is quite affordable and the quality is good for the price. The price of the curling iron is quite affordable as compared to its quality. It has a temperature range of 200 to 410 degree Fahrenheit with a high-low setting. The brush like design is very convenient to use and opens the curls easily. The heating rod takes some time to heat evenly and is not suitable for thin or short hair. It makes the hair look a bit frizzier. This affordable hair curler machine is great for travelling purposes as it serves as a hair brush also. It works well on long hair and the dual ionic technology prevents hair damage. One of the most popular hair curlers available in the market, the Conair InfinityPro curler is available in three color options and is suitable for creating any type of loose or tight curls. The curling rod is made up of tourmaline ceramic technology and heats up to 400 degrees Fahrenheit. It comes with an auto-beep feature which lets you known when your hair is curled to perfection. It has 2 heat levels and 3 timer settings you can choose from. The price of the curler is moderate but you can get it at a discount online. The auto-curl chamber draws hair smoothly to curl it as per your preference. The 2 heat settings and 3 timer settings offer complete customization. The auto-beep feature lets you know when your hair is done to reduce hair damage. The price of the hair curling iron is a bit high. You have to untangle your hair before using the curler. This curler machine from Conair is a very safe and easy way to curl your hair at home without any heat-related damage. It gives professional results and is of great quality. With three styles to choose from, the Babyliss Pro curl machine provides a great curl hold and effortlessly curls your hair in just a few minutes. It uses steam to curl your hair and heats up to 450 degrees Fahrenheit. The curl chamber heats evenly and does not add frizz to the hair. The curler is lightweight and has an ergonomic design with auto shut-off mode for safety. The price of the curler is high but you can get it at a good discount online. The steam reservoir holds enough water for 2-3 curling sessions. It gives a 24-hours curl hold and is available in three style variations. It heats evenly and quickly to give you all types of curl definitions. The price of the hair curler is very high as compared to other hair curler machines. Excess steam may burn your hair if you leave it inside the curl chamber for long. Steam curlers which do not damage the hair are hard to find and this machine from Babyliss uses advanced technology to give you great curls which last for the whole day. If you are looking for a multipurpose hair curler with a brush design, the Miracomb curler brush is available in 2 variants and both of them are good for daily styling. It comes with a 360-degree swivel cord and uses anti-scald bristles to protect your hair. The curling barrel has a ceramic tourmaline coating and comes with five temperature settings. The curler shuts off automatically after 30 minutes and comes with its own heat-resistant pouch. The price of the machine is affordable. The price of the curler is affordable as compared to its features and design. The 360-degree swivel cord makes it easy to hold the curler at any angle. The five adjustable temperature settings suit different types of hair. The design of the brush does not untangle the hair properly. The auto shut-off feature switches off after just a few minutes. This styler is affordable and serves multiple purposes as it is designed like a hair brush but also curls and styles the hair. The bristles are soft and do not scald the skin or the hair even at high temperature settings. With three sizes and two color options to choose from, the Anjou curling iron is suitable for all hair types and has a 1.25 inches barrel. It heats up to 410 degrees Fahrenheit and comes with a 360 degree swivel cord with stainless steel design. The curler heats up and cools down very quickly due to its ceramic coating and comes with a heat-resistant glove. You can adjust the temperature easily and get quick results with this curler. The price of the curler machine is very affordable. It is available in two variants and three size options to suit different hair lengths. The temperature range is good and the curling barrel heats evenly. The ceramic coating does not damage the hair and reduces frizz also. The curls created by the curler do not hold well for long hours. The design of the curling iron makes it a bit heavy. This curling iron is good for thin hair as the barrel size is suitable for all types of hair. The color options and the size variants make it easy to choose the right curling iron for your hair type. Available in two size options, this curling iron brush can be used to curl, straighten, and comb your hair with ease. It comes with nylon bristles and a cool tip to prevent any burns. The curling iron uses ceramic tourmaline technology which removes frizz from the hair and locks moisture. It has a temperature range of 265 to 430 degree Fahrenheit and shuts off automatically after 60 minutes. The price of the curler is moderate if you compare its quality with other hair curler machines. The 60 minutes auto shut-off feature is good for people who are in a hurry. The cool tip prevents scalding and the nylon tips untangle hair easily. The temperature range is good for curling thick and coarse hair. It does not curl short hair very well and is a bit bulky. It takes some time to heat evenly. This curler brush is so multipurpose and has a good temperature range for all types of hair. It has some great features like auto shut-off and temperature lock which make it worth the price. 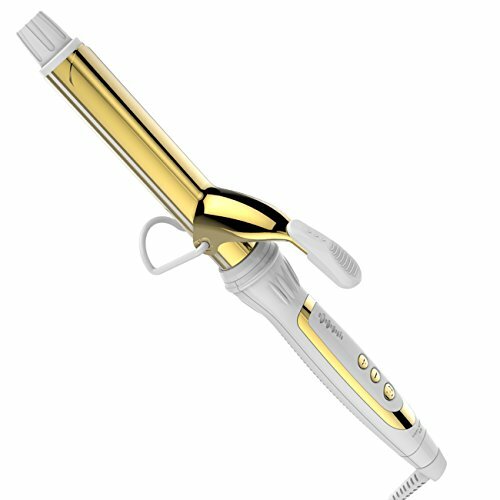 With barrel size options of 1 inch and 1.25 inches, this curling iron comes with a long barrel and is made using nano gold ceramic technology. The barrel length is perfect for long hair and if you want a lot of curls. It is suitable for long hair and heats up to 420 degrees Fahrenheit. The 360 degree rotating swivel and the safe stand make this iron very easy to use. The barrel heats up quickly in just a few seconds and automatically shuts off after 60 seconds. The price of the curler is reasonable. The barrel length of this curling iron is longer than other hair curler machines. It uses nano gold technology to control frizz and deliver soft curls. The price of the curler is reasonable as the quality is really good. It is not suitable for short hair because of the long barrel length. The barrel heats up very quickly and can cause burns if not handled properly. This curling iron is good for people who want tighter curls and have long hair. It comes with a safe stand which helps you to keep the iron on hold in between hair sections easily. Available in three barrel sizes, the Sultra Bombshell curling iron takes just a few seconds to curl your hair to perfection. It uses ceramic care technology to generate infrared rays which smoothen the hair and lock moisture. It also comes with an auto shut-off feature and a safety glove for added safety. The cord of the curler is of 9 feet and swivels in all directions. The price of the curler is higher than some other curlers available in the market. The curler curls the hair in just 8-10 seconds and does not overheat. The three barrel options make it suitable for all hair types and thicknesses. The ceramic care technology gives you smooth curls without any frizz. The price of the curler is higher than other hair curler machines. It is not very suitable for creating tight curls as the barrel size is thick. The price of this curler machine may be high but it gives very smooth curls and works well on all lengths of hair. The cord length and curler design make it very easy to use. A dual straightener and curler iron for all your hair styling needs, this styling tool from Berta has a temperature range of 275 to 425 degrees Fahrenheit and comes with ceramic coated plates. It automatically shuts off after 60 minutes if not used and heats up evenly and quickly. The dual voltage feature also makes it a good curler for travelling purposes. The price of the hair curler machine is moderate as compared to its features and quality. It is quite multipurpose as you can curl and straighten your hair with one machine. The ceramic tourmaline plates do not burn the hair and heat evenly. 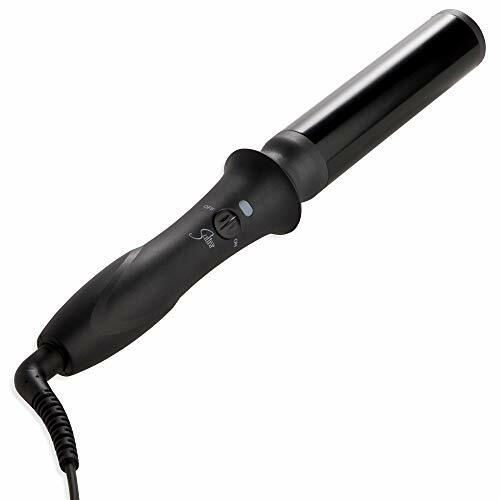 The temperature controls and LED display make it easy to operate this curler. The size of the curler is too big and it can get uncomfortable to hold. It keeps switching between curler and straightener unless you hold down the button. This 2-in-1 hair styling tool is great for people who want to try different hairstyles and need a straightener as well as a curler for their hair. It is reasonably priced and does a great job at curling all lengths of hair. If you have thin or short hair, go for curlers with a shorter barrel length as these curlers will help you style your hair easily without burning them. Fine hair need to be handled carefully so it is better to choose a curler which is designed specifically for this type of hair. Long hair require a curler with a long barrel. You can choose the barrel width depending on the length of your hair and the types of curls you want. Go for a smaller barrel width if you want tight curls and a large barrel width for voluminous beachy waves. Other features of the curler include auto shut-off feature, safety glove, safety stand, anti-scald bristles and cool tip. You can check all these features before purchasing the curler to get the most worth for your money. Some hair styling tools also come with a straightener or a combing brush to help you create even more hairstyles. You can get a good hair curler in around 30$ – 60$ depending on its quality and features but some curling irons also cost much higher as they include some latest features. Check for online discounts which can help you save a lot of money. So this was our detailed guide on some of the most popular hair curler machines available in the market. These hair curling irons are great for creating professional hairstyles at home in just a few minutes. This detailed buyer guide will help you find the right curler for your hair type and budget. I want to look after my hair during curl I wonder what temperature should I set up? I warn you never go more than 400 degrees Fahenheit. If you have curly hair, 200-300 degrees is fine. However, the most hot tools stay between 300-395 degree. So, you should set the heat properly to your hair. I’m not sure if I should use hairspray before curling? I suggest you to use hairspray once after you finish styling because hairspray and heat from curling tools can dry and damage your hair. I’ve grown to like BERTA Professional Hair Curling Iron.